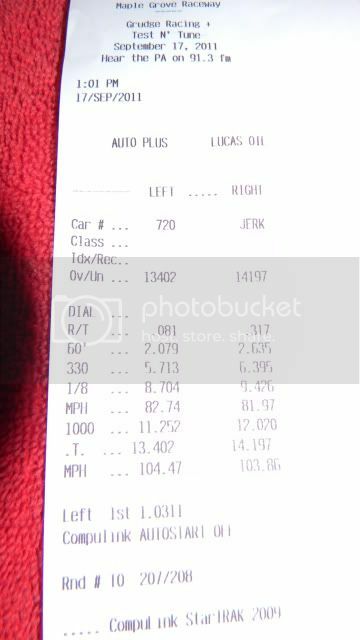 The Quarter Mile Drag Racing Results, Questions, All Things Quarter Mile! You got em? Post em up. Who's got the biggest ballz of them all? ^you beat me to the punch sir. Lets please keep this thread clear of clutter/bragging/criticizing. This is for time slips only, so we can can see how fast we are. Also, please post your mods too. My best speed however was 88 I believe though. 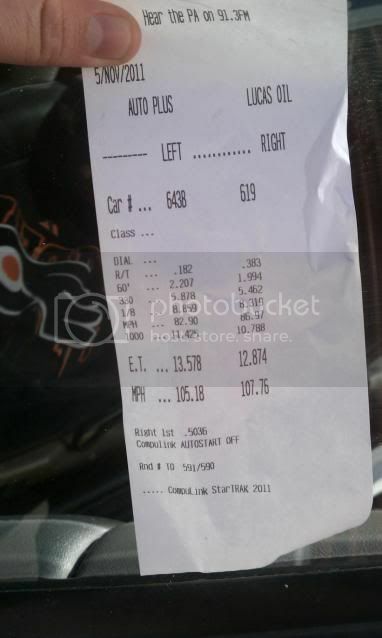 Just for giggles though the Red Camaro has done a 13.402 at 104.40 and the White Camaro has done a 13.578 at 105.18. Last edited by 3.8blackmaro; 11-08-2011 at 11:41 PM. Old thread with not that many slips but mabey ill get some ppl to add a few more. Here is my slip to add. Best so far this season. Last edited by fasteddi; 09-08-2014 at 04:27 PM. Last edited by insidethreat07; 09-08-2014 at 09:31 PM. I have a new slip to add. 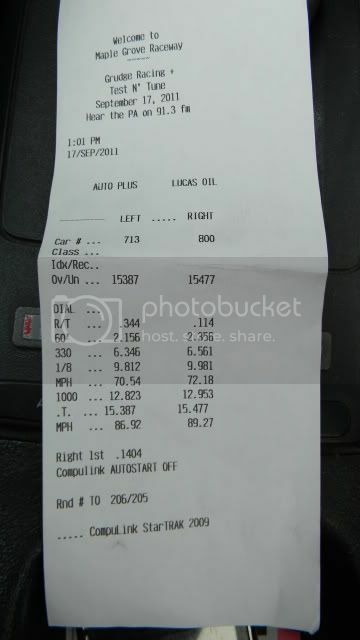 Heres a 11.70@115Mph to add. Still 14.5psi of boost just a hellof a launch. 1.64 60foot time! Heres a matching video of the run. I will have to find my best time slip from my 1994 when I get home. It was around 17.785 and 78 mph or so (damn high altitude ).